--> Renowned German novelist, poet, playwright, illustrator, graphic artist, sculptor and recipient of the 1999 Nobel Prize in Literature Gunter Grass passed away on 12 April 2015 in the city of Lubeck. --> The list of his works is very long, and includes "Cat and Mouse" and "Dog Years", which, together with "The Tin Drum", were part of his famous "Gdansk Trilogy"; "Local Anesthetic", "The Flounder", "The Rat", "The Call of the Toad" and "Crabwalk". --> Gunter Grass was a multi-talented artist, not only a novelist and poet, but also a sculptor and designer who occasionally also designed the covers of his books. --> Sania Mirza on 12 April 2015 created history by becoming the first female tennis player from India to achieve the world number one rank in doubles, following her stupendous title win at the WTA Family Circle Cup with partner Martina Hingis, Charleston. --> Sania took 470 points from the win to take her tally to 7965 as she jumped past Italy’s Sara Errani (7640) and Roberta Vinci (7640) to sit atop the ranking table. --> Before Sania, only Leander Paes and Mahesh Bhuapthi had achieved the top rank when they dominated men’s doubles circuit in the late 90s. --> Sania is also first female player from India to win Grand Slam tournaments. --> World champion Lewis Hamilton won the Chinese Grand Prix for the second year on 12 April 2015. --> Nico Rosberg finished second while Sebastian Vettel and Kimi Raikkonen finished third and fourth for Ferrari. --> Williams drivers Felipe Massa and Valtteri Bottas finished fifth and sixth respectively. --> New Zealand beat Australia in the 24th Sultan Azlan-Shah-Tournament 3-1 in the Shoot-out stages held at Malaysia. --> New Zealand was put ahead by Penalty-Corner-goal from Andy-Hayward, until 29 minutes before close when Australia equaled the scores. --> New Zealand won the cup for the second time; first was in 2012 when they beat Argentina. 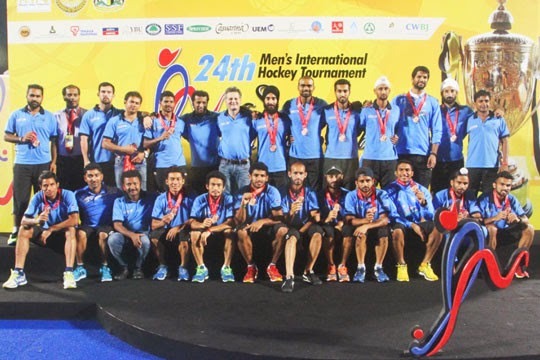 --> India defeated South Korea 4-1 (6-3) on penalties to win the bronze medal. --> Azlan Shah Cup is named after ninth King of Malaysia, Sultan Azlan Shah, who is known as the "Father of Malaysian Hockey"
--> Air Pegasus on 12 April 2015 commenced its commercial operations with flight services to Hubballi and Thiruvananthapuram from its base in Bengaluru, becoming the second regional air operator after Air Costa. --> Civil Aviation Minister Ashok Gajapathi Raju launched the operations of the airline promoted by ground handling services provider Decor Aviation. --> Bangalore-based Air Pegasus recently acquired flying permit from the Directorate General of Civil Aviation (DGCA) and is the third new airline to receive the permit from the aviation regulator in last one year, after AirAsia India and Vistara. --> Bharat Heavy Electricals Ltd (BHEL) announced that it has commissioned another 600 MW unit of a thermal power project in Chhattisgarh. --> The unit was commissioned at Dainik Bhaskar Power Ltd's (DBPL) upcoming 2x600 MW thermal power project located at Dhabra in Janjgir Champa district of Chhattisgarh. --> Ace Indian shooter Jitu Rai has won a bronze medal in the 10 meter Air Pistol (Men) event in the ongoing ISSF World Cup Rifle/ Pistol Shooting competition being held at Changwon in South Korea on 12 April 2015. --> Jin Jongoh of South Korea has won the gold medal in the same event by scoring 206 points while Naung Ye Tun of Malaysia has won the silver by scoring 201 points.